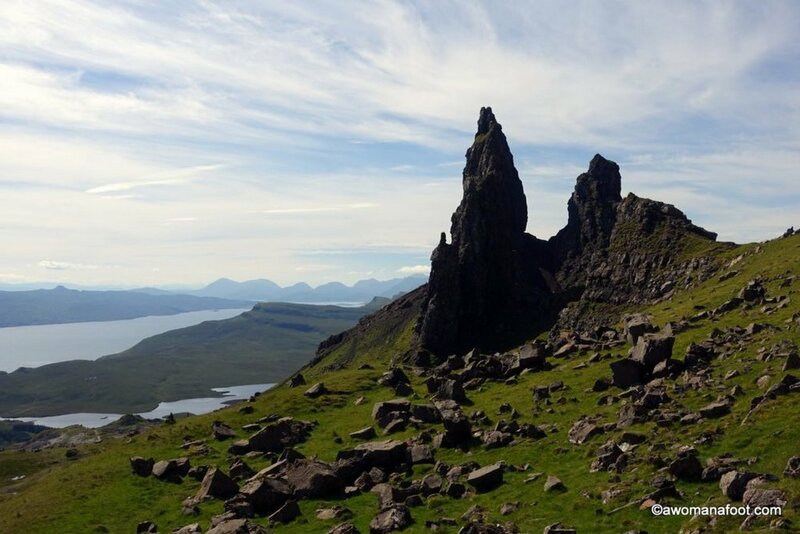 The Old Man of Storr is one of the most famous and iconic rock pinnacles on the Isle of Skye. It quite deserves its fame – among other rock formations around the Storr - it creates a stunning image. When I visited the Isle of Skye, my plan was to head directly north to Rubha Hunish and do as much of the Skye Trail as possible. But I changed my plan after finding out that there were Highland Games to take place in Portree in just two days. 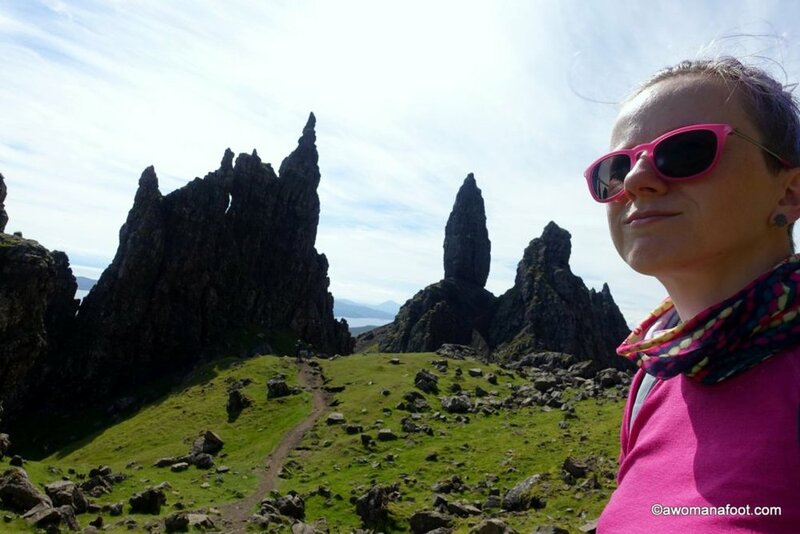 I had one day to fill so I decided to go and hike the famous Old Man of Storr in the morning – free of the heavy backpack which I left at the campsite. It proved to be a genius idea: the next time I was to be at the Old Man of Storr it was a sorry and miserable day. This way I had a lovely light hike (in terms of weight carried, the hike itself is not light at all) in absolutely beautiful and sunny weather. The best way to hike the Old Man of Storr is to take a bus from Portree. It stops right at the bottom of the trail. Check the timetables ahead of time – they don’t run all that often! I missed the bus when going back and waited about an hour before someone took pity over me and gave me a ride back to Portree. The path up is very clear but steep. You might need to take it slowly if you are not used to climbing hills. With every step up we are awarded with beautiful views out over the Sound of Raamsey. For a while the man-made path leads through the felled area. There are efforts all over Scotland to replace the foreign species with native woodland. After a while we pass through a gate and the man-made path changes into natural path through the moors. The path is eroded in many places, as people go around difficult parts requiring stepping on stones or such. When I was there during heavy rains the paths looked horrible, the whole flat moor area was turned into muddy pools. But when I walked there in sunny weather the erosion wasn’t as visible and obvious. 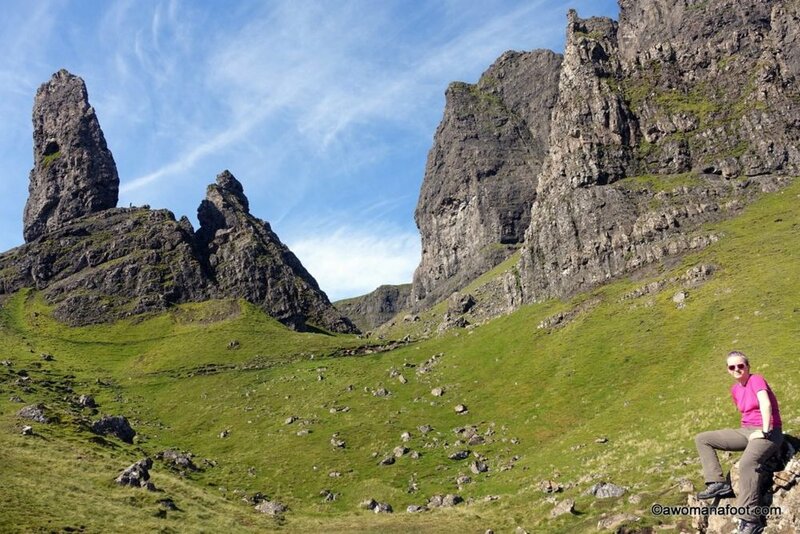 When you reach the upper area you have a few different paths to choose from to walk around the Storr. Do you like the photos from Scotland? The Old Man is hidden for a while, becoming one with the other rocks. But at one point you suddenly see it in all its glory and it’s just strikingly majestic. There are more rock pinnacles around - like The Needle, and all of them together are called the Sanctuary. I wish I spent more time up there… At one moment up there, I checked the bus time table and realized the return bus was coming in 10 or 15 min. Without thinking clearly, I just run down thinking I could make it. Obviously, even when going down, it's still a long way and I missed. I should have stayed there longer and walk up the path around and over the Storr's peak. It's a pity not to use such a stunning weather! I have seen photos taken from the Storr down toward the Sanctuary (the collection of the separate rocks) – magnificent and worth the effort to find a good point of view from above! If you are unsure what you should take on a day hike - please, take a look at this list of day hike essentials to stay safe. Have you done it? Were you lucky to do it in fair weather? Solo on Skye: Enjoying the Island of Skye Highland Games (even in pouring rain)!